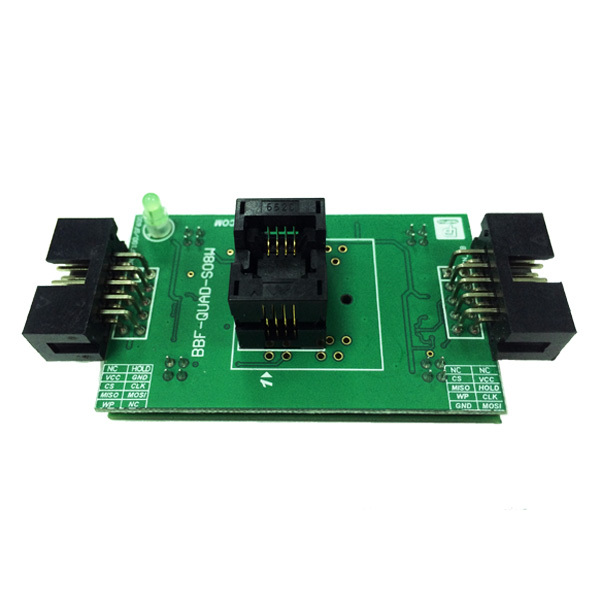 The Backup Boot Flash QUAD (BBF-QUAD-8W) is an ingenious tool created by DediProg to allow the application controller to work on the backup SPI Flash inserted in our tool SO8W socket. 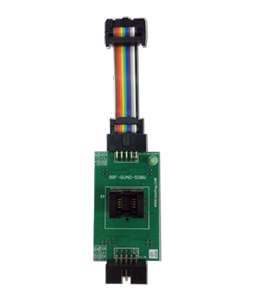 It allows the application controller to access the backup SPI Flash with SPI single/Dual/Quad IO mode. Our BBF cable (included) to the application 2X5 2.54mm pin header. Our BBF cable (included) to our SMT 1.27mm Pin Header (included) soldered in place of the Main Serial flash footprint for a better stability. The Serial Flash can be easily changed manually thanks to the SO8W socket or even updated by connecting our SF100 or SF600 programmer. The SF100/SF600 programmer is completely transparent for the application and will offer to developer high flexibility for code trials or update. When using BBF-Quad on a board, the soldered spi flash needs to be removed.